DE: 4 Tage Sonne, Strand und Relaxen. Vor Kurzem ging es für uns zum allerersten Mal nach Ibiza und bei dem aktuellen deutschen „Sommerwetter“ wünschen wir uns schon sehnlichst zurück! Relaxen ist auch das richtige Stichwort für unsere Unterkunft auf der schönen spanischen Insel – und zwar übernachteten wir im Ibiza Sun. Direkt als wir ankamen und den Poolbereich betraten, setzte der Urlaubs Modus ein und wir waren einfach nur happy. Junge, entspannte Leute, super coole Musik und meega bequeme Sonnenbetten und -liegen. Da konnten wir mal so richtig abschalten 🙂 ..und wir müssen gestehen, wir haben die meiste Zeit am Pool verbracht, obwohl der Strand direkt nebenan war und wir normalerweise die absoluten Strand-Gänger sind 🙂 Aber die chillige Atmosphäre und zwischendurch eine kleine Abkühlung im Pool war dort einfach perfekt! EN: 4 days of sun, beach and relaxing! About 3 weeks ago we’ve been to Ibiza for the very first time and we totally wish to be back right now. 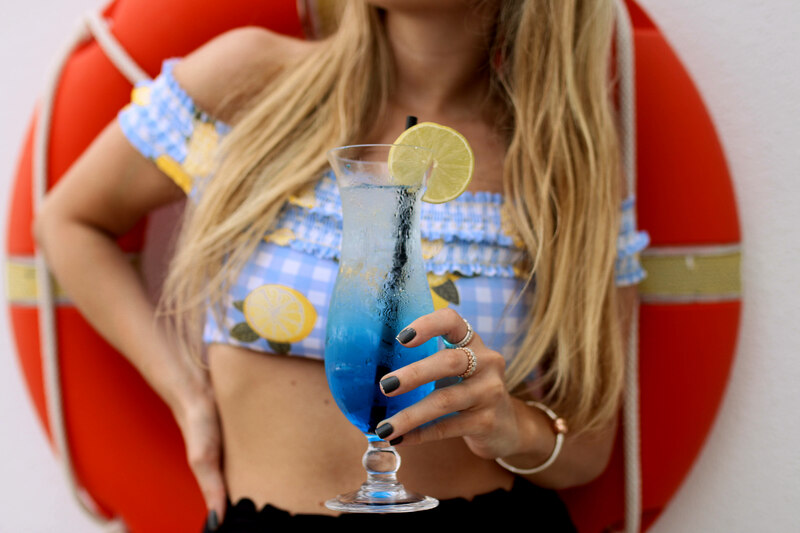 We had the best time ever and relaxing is a pretty good word to describe our hotel experience on the beautiful Balearic island – we were staying at the Ibiza Sun Hotel. As soon as we entered the pool area we totally got into vacay mode and we were just happy. 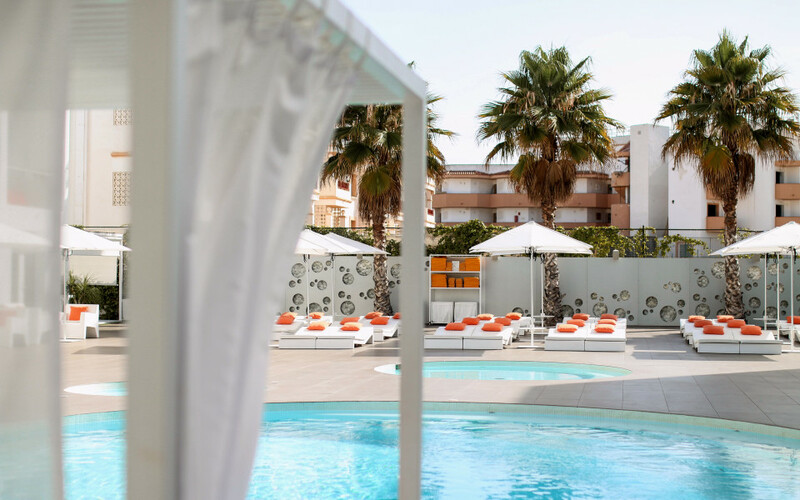 Young, relaxed people, great music and super comfy sunbeds – perfect to calm down and enjoy the sun. We have to admit we literally spent most of our time at the pool eventhough the beach was around the corner and we normally always go to the beach. But the chilly atmosphere and the refreshing pool were simply too good! 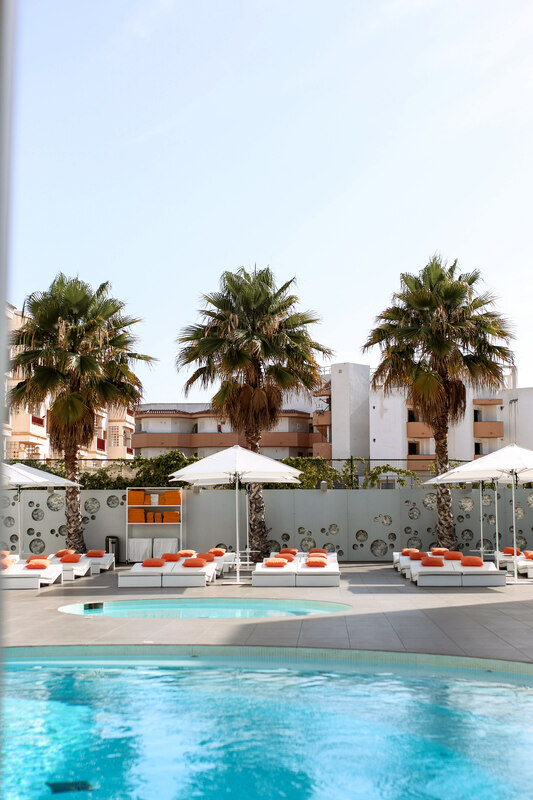 The hotel is located near the famous party beach „Playa d’en Bossa“ so party and clubs weren’t that far. Nevertheless we rather wanted to calm down and relax and weren’t that much in the mood of partying but next time we definitely want to check out the club scene! The beach is only a 5 minutes walk away and there are also lots of shopping possibilities around which was pretty good for us since we had not rent a car for this short time. (But you definitely should if you’re staying longer since there are so many pretty spots to discover – some of them you can also find in our Ibiza Travel Diary HERE). We were also totally happy with our room! We had so much space – a living and kitchen area, a separate bedroom, a bathroom and a little balcony. Finally enough space for everything 😀 Do you know that moment when you two people are entering a hotel room and within seconds every corner is already full with stuff? 😀 That’s how it always works with us. So having so much space was pretty cool. The room service even washed our dishes. What a great service since we actually wanted to do this on our own. In lovely collaboration with Ibiza Sun Hotel. This looks so relaxing and a perfect get away spot!